The update to Android 5.0 “Lollipop” is certainly taking its sweet time at arriving on a number of deserving handsets. Thanks to a number of bugs that Google has been addressing over recent months, to carriers being slow at testing new builds, to manufacturers dealing with both of those factors at the same time, phones like Verizon’s LG G3 are stuck waiting. We still don’t know when Big Red’s variant of the G3 will receive the update, but we do know that it is either in testing or beginning to rollout very slowly at this time. At least two users in the wild have received the update during the month of February as software version VS98523A, Android build LRX21Y, and Android version 5.0.1. The update actually first surfaced in Verizon’s own community forums on February 12, where a member was looking for help because they were experiencing an SMS bug while running Lollipop. A Verizon customer support agent responded three days later, suggesting that this wasn’t possible, because the G3 wasn’t running Lollipop yet. The member then posted their software details, matching the ones we just mentioned. Of course, they never heard back from that support agent again. Then this weekend, a G+ user received a replacement LG G3, “fired it up,” and the update started downloading immediately. The update weighed in at around 717MB and is indeed Android 5.0.1. He has since posted a number of screenshots, including the About screen, download screen, and navigation button options after the update. He has also been working with XDA members to try and pull everything possible from it. 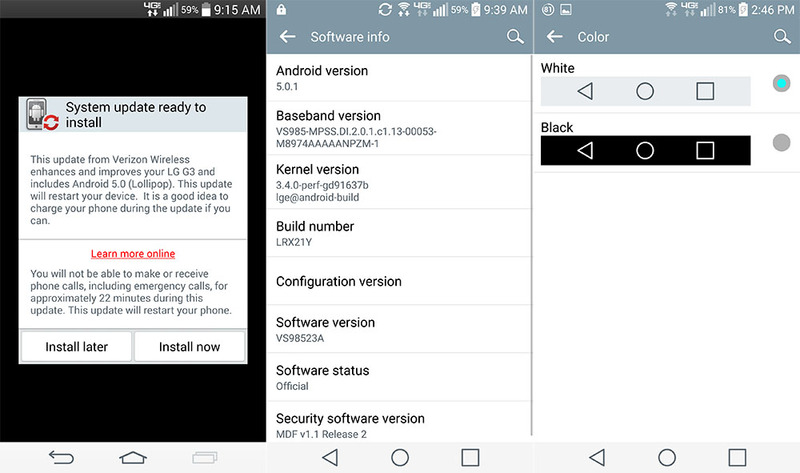 Tough to tell how many Verizon LG G3s have actually seen the update. At this time, it seems like very few. But if this means anything, it’s that the update is at least in testing and could be here before long. We recently took Lollipop on the G3 for a spin and have included that video below to show you what to expect.